Here's an interesting video of some Alan Watts philosphy. It offers a very powerful essay in living in the now; about how we're so often programmed in society to look to goals and aspirations ahead of us; so much so, we don't actually live in the moment, and what's worse, we don't fully engage with the moment. But I ask: why is it that so many people actually do strive for some future aspiration? Is it all negative, or is there something positive about it too? Firstly let me say I totally agree with being completely and utterly in the moment - with absolute commitment to it. For only then, will it be successful and fulfilling. But maybe there's more to this moment than initially meets the eye? In my world, we have the power of vision because we can actually create the future through us. Since there is only one moment of now, then in that landscape, there must be parts of the past we've just left 'behind us', as well as parts landing from the future 'jigsaw'. If I can feel and intuit that flow of energy as it leads into the future, then I'm going to amplify that energy and..... actually bring it into being. And I would put it to you my friends, that's actually why we're in a physical world in the first place - at least partially, to enjoy the creative process in a physical way. In other words, to bring the divine into being. So then, maybe there's a balance to be struck? Yes I agree, if you're trying to envision and manifest the future you would want - what the separated ego wants - then as it says in the video, the strong possibility is you might miss what actually happens, and not enjoy the life you're living right now. But being in the flow however - the divine flow - is something entirely different. If you're continually confronting the distorted desires of the ego and letting them go, then you create space for true beingness to arise through you; one aspect of which, is actually being able to read the flow of events. If you can do this, then you can bring your creative expression to bear within the flow; in which case, you manifest all manner of wonderful co-creations. However, if you keep dissolving those sparks of inspiration because you're somehow efforting to be in the moment - switching all thought off for example - then it's likely to lead to a very suppressed and unfulfilled life. I agree with what Open writes. Especially about balance. Things are rarely "cut & dried", & it's easy to go to extremes, even on the spiritual path, & miss out on the fullness of life, with it's contradictions, tensions & paradoxes. Yes, I totally agree. There seems to be a rigidity, especially within spiritual circles to do everything the 'right way'. This feels to me as unhealthy as living our lives with complete unawareness of our connectivity to everything around us. There is a real danger of overthinking everything and being bogged down by what you think is right and not actually feeling what is right for you. My motto now is to keep things simple and as close to nature as possible. In this space I am who I really am, not influenced by others opinions, following blindly. We all need guidance and comfort at points in our lives but it's very easy for me anyhow, to tip the balance to a not so good level where I'm striving instead of feeling and rolling with it. I love this video - Alan Watts has always had some great things to say. Loved the video and all that is aid here. Open you said;(If you keep dissolving those sparks of inspiration because you're somehow efforting to be in the moment - switching all thought off for example - then it's likely to lead to a very suppressed and unfulfilled life. So yes, let's be in the moment, but let's make sure we're in the fullness of the moment: let's make sure we're amplifying beingness around what feels right and aligned as we bring into reality the divine that wants to flow through us. I am guilty as charged 😀😀😀. I regularly dissolve thought because I want to live in the moment and have often felt suppressed as a result . And in fact that leads me to 'do' but then I'm constricted by my propensity for linear thinking . And round and round I go. There are occasions when I'm able to let go and also ride the Flow. But I need a heck of a lot more practice at that. Hi Megha, and to all reading, there is being awake to the soul, but then it's another pretty big leap to actually living in the flow of the soul. It's the stage of the 5GATEWAYS that I call "Realignment", where we surrender completely to soul-led decision making in life, which becomes a moment by moment process. The realisation has landed that there's nothing else that's truly authentic going on. 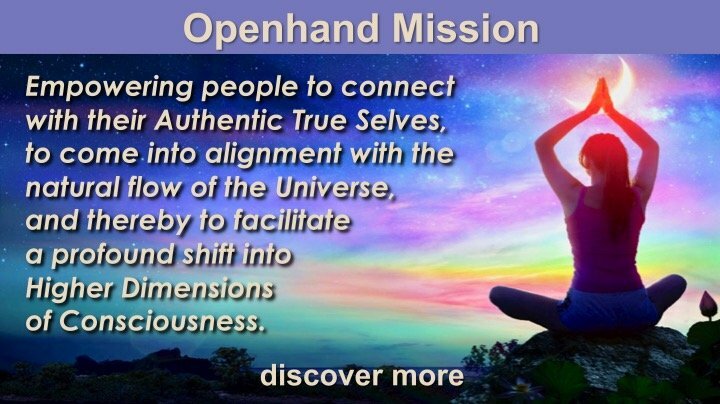 In the Openhand Philosophy, the purpose of the soul is to fully express itself in the crucible of life - what that really equates to is that the soul creates situations and circumstances to integrate through, to forge more authentic and aligned ways of being. It will likely be that in the system, this educational/evolving/integrational purpose of the soul coincides with the general activities of jobs, careers, relationships and some aspirations and desires for physical outcome. My observation is that physical outcomes will happen, but they happen in the most aligned and benefical way when they are as a product of self-realisation/self-actualisation. So the key is to always be working to express authentically, and to unravel what you perceive as distortion (felt as tightness in any particular engagement - for which here at Openhand we apply the Breakthrough Approach). This will lead to a flow of expression that creates things. In fact my observation is that it's infinitely more creative than the ego which is tied to particular threads of conditioning. But we have to be prepared to break apart the way decisions are usually made (from the ego perspective based on logic or emotion). Instead it is to soften into what I call the "consciousness landscape". Rather than creative situations being strictly linear, working toward specific outcomes and desires, there's an opening up to active attention, rather than fixed intention. So what happens is that at a soul level, you start to witness more of what's going on around you in the moment (because your perspective isn't so narrow and focussed). Parts of jigsaws start to spike in your awareness, which could be for the immediate choice in front of you, or days ahead, or weeks ahead, or even years ahead. For example, right now I'm in the process of moving to a new house. A natural question seemed to pop up, "for how long will this be?" Practically immediately afterwards I'm seeing signs of "the next move", "flowing, flexible, nomadic". And then I'm seeing a particular type of car - the "yaris", and suddenly it clicks, "I'll be there for one year". That seems to land as a knowing, felt as a clear sense of 'clicking/spiking' in my awareness (you have to let go of a lot of mind led intention to feel this clicking/spiking of higher mind). Although it can't be certain until the moment lands, already it has a few distinct effects: (1) it has an direct impact on the beingness I feel to express - more fluid, more adventurous, more entrepreneurial; crucially I'm invited to embody this beingness right now, which begins to shape what possessions I keep or let go of (2) already that naturally colours the choices I make right now in furnishing the new place, for example, and the ridigity that I allow to form in terms of contracts etc (3) I'm already watching for signs to click into place for the next step, future landing now. But neither am I living in the future. I'm simply witnessing what spikes in my awareness, and allowing it to be in my consciousness landscape. I allow the soul to do the rest - I go with how it wants to express in relation to that new forming landscape. In this way, it becomes much clearer what are actually soul led choices. You actually find that you can't make a choice that contravenes the energy. To give an example, yesterday my biological family completed the sale of the old Openhand retreat house in Glastonbury. It was given to me to hand it over to the estate agent once the house had been cleared, which I duly did. But as I was leaving the town, something didn't feel right, and although feeling under time pressure to push on, nevertheless I felt a pull to go back, but for what, I didn't know. I just felt I should go back to the agent and check in with them one more time. Which I did. Synchronistically, as I arrived back at the agent, the new buyer was there at exactly that moment, whom I hadn't previously met. Instantly I realised the point - the retreat centre is on sacred ground, and it was essential that it be handed over person to person. Rather than it being very synthetic and sterile (through the agent), instead there was a soul to soul connection. The new buyer could feel the energy and love which had gone into the space, which I sensed was very important to how things were handed over. Upon completion, the pathway forwards then felt clear, and I was able to head on my way. It felt 'complete' and signs of 'completion' suddenly appeared all around me on trucks and billboards. Not only was future-landing-now, in that I could now move on, but also past had been unraveled. So I simply knew I was in the flow. This is what I mean by the 'consciousness landscape'. Instead of coming from fixed intention to do things, or fixed timings and schedules, you're opening into active awareness around what is spiking in my field now? You won't necessarily immediately get what that's about, but the stronger soul infusion becomes, the more it is directly choosing to flow in that multidimensional landscape. You're embodying beingness now, and it becomes clear as inner feelings/knowings, of what is aligned - you simply cannot make contradictory choices - they simply don't feel right. So you're watching with active awareness and simply noticing what's showing up, trusting that there is meaning and purpose. And as you walk forwards in this landscape, it's like the Universe then clicks in under each step. You even get to feel an audible/perceived 'click' in the senses. So this is what I mean about opening up the ego to coming from soul-led decision making - the "realignment". You said synchronisty spiked for you to stay at the new home for a year but if the soul is free flowing and unpredictable how can it be fixed for a year? As I said I'm on travel by woofing and I'm currently at a beautiful farm. Although it's exactly my kind of place it doesnt feel right to stay here for very long and I know I have to move. This is not really comfortable for me or to which I'm very used. I can be quite content where I'm given very little. But to move I have lots and lots of choices ahead of me and I know from experience the mind is really powerless in choosing what's right or where to move. Since I'm working within a fixed system it's not really possible to be spontaneous as it involves giving prior notice weeks before. But neither I'm proficient to flow with the soul by watching signs and synchronicties. What works for me is to surrender all intentions and concepts of coming from the ego or flowing with the soul and do what feels right now. Which could be giving out requests to places I find interesting and which is easily accessible. But still I ask who finds it intresting and determines if I'm given to go to an accessible place? Im also unsure of my time here since nothi g is fixed and playing with these questions in my mind. I wish if the answers were more readily available! It's so wonderful you are Woofing ! Such a wonderful way to see more of our beautiful country . And in such a grounded ,loving way too . I sense it is also a much grittier lifestyle to what you are used to ( I'm a pukka city gal so I know it may be hard to get used to rural community ) . I live in a comparitively linear environment with a very linear job . Medicine is awash with protocol and there is a strident effort to take out spontaneity and innovation( because of course babies are just pieces of flesh - don't even get me started ! ).Here too ,I have had to learn( to unlearn ) to innovate . I look at it as my own quiet rebellion within the system that would rather I not walk on the edge. So I regularly ' feel' into what my babies need from me rather than what the books say I must do. In that way I have managed to reduce infection rates ,intervention and a dozen such things that are concerned par in other units. Because the little ones are much less stressed ,I get the mom's in much more . Being a mom myself ,it's such a joy to see them bonding with their babies no matter how wee. What I am trying to say is that try to break free from our own minds tendency to be owned by what appears to be Rock solid truth in circumstances. To quote Neo in the Matrix- " Some rules can be bent ,others broken " Keep looking at better ,more innovative ,whackier ways to do things and suddenly the Universe responds with more opportunities to exercise that innovation not to mention the joy and purpose in living that reality entails. What Open talks about ,though, is taking that Beingness to the next level . Infusing every moment with Openness ( pun unintended but apt 😀) . Which means allowing one moment to allow for the birthing of the next . I do manage to do this in some aspects of my life . I bought the apartment I am staying in ,in just that way. Hoped for something and then kept following the bread crumbs until I found both a friend ,a community and a home all in one fell swoop.Its within stones 's throw of my kids school and my workplace ,so my commute is zero. And being of a simar bent of mind as the owner ,it felt like home from day 1 . Don't do it as much or as often as Open describes though. Also like you I am learning to read Signs and synchronicities ( similar to where you are with that one ,mate ) . It's a playful ,curious ,open way to Be that he describes 😀 . And so fulfilling ! lots of love as we both explore ! Hi Vimal - if I get a sign like, "you'll be there for 1 year", I don't take that as fixed or certain. But if the sign itself clicks and spikes in the field which I clearly feel, then I'll step in that direction. For example, in renting a place, I'll make sure I don't have to commit to longer than that period. And it will influence the degree to which I establish myself there. But it's definitely not fixed. When you say you have to give prior notice 'weeks before', well that could likely be a part of how the flow needs to crystallise here in the matrix to fulfill an agreement. But work to soften the mind even around that - what if a typhoon swept through the whole area, then you definitely wouldn't be tied to the agreement! The point being that there's a flowing interplay with the system istelf and everything is now changing. You can step in a certain direction that feels right, but that doesn't mean things are fixed. I recall being at an airport once heading toward a gate to catch a flight and the synchronic9ty in the flow (I left the 9 in synhcronicity because that's how it typed and 9 is the number of the higher dimensional Openhand team) caused me to notice a particular couple of people. I wasn't sure why, they just spiked in my attention. I was waiting in the queue for boarding to start, and wondering why it hadn't already begun, when suddenly again my attention was drawn to the couple, wlaking off in the other direction. Even though I was waiting for my plane, something said "follow them". I know enough not to ignore guidance when I clearly feel it, even if it seems completely illogical. So I followed them. It turns out they were getting on the same flight as me, but the gate had been changed, which I didn't know about. I was the last person on the plane and the door closed right behind me! The invitation is to get used to this degree of flexibility, even if it seems to go against the logical and systematic. Thankyou for your lovely support. I'm sure you are working to bend and infuse light into a very rigid system. I know how hospitals are here. I had teached in institutions for a while named 'matrix' and I could clearly see how the rigidity inside me related to the rigidity and the fear within the system and I was working to infuse beingness inside me which meant bending the rules from inside at times and it was wonderful to see many positive reflections in the outside. I'm not a city guy, yet I'm not used to this level of uncertainity and juggling the questions within my mind. It's challenging but also I know this is the right thing to do now. Right now I'm in a farm in karnataka and I have to interact with the down to earth local people here and I don't speak kannada! But yet I really connect with the lovely fellows more so than the intellectuals from the city bangalore. Stepping away from family and my usual ways has provided a lot of positive and challenging changes and I'm not planning to return atleast for a year as of now. But who can predict even that! I knew their won't be a definite answer from you especially when I'm wanting it! Lol. I know it's more about the question than the answer. So that's what I'm doing, playing with the questions in my mind without getting sucked into it. And also hoping that I would get some pointers when the timing is right. When plenty of options are available within the landscape, is there's such a thing that most opportunity for self realization is within one of them. Or is that the ego asking the question. But I know even if there was something like that, there is no way for the mind to know and choose such a thing. Or are creating moment my moment irrespective of the choices. So that the choice doesn't matter.but the act of choosing matters. So how did I chose this farm from numerous choices. There was a lot of intellectual efforting and frustrations created by the perfectionist in me and pulling in entities and nauseating. After a while a surrendering and a realizations that it doesnt really matter what I choose. Seeing that if I keep on waiting for the right choice which is guess is an illusion then I woudnt start at all, I booked the tickets to the nearest city for the available date. Even then there some confusion but this farm owner was available the exact date I was arriving which I thought was a clicking into place. I woudnt know what would have happened if I had opted the other one. That doesnt matter because wherever I'm there's plenty of reflections and possibility of growth. So ultimately its not about struggling within the choices. Seeing that it doesn't matter. Whatever it is, it's not worth striving for and pulling in entities. It's better to have an open mind and heart and welcome whatever that's coming my way with grace and acceptance. Hi Vimal, yes, making choices from the soul is quite different from ego led choices. You learn to hold your creations more lightly until you actually take the step into them, in this moment. So they start to shape well in advance, but they're not fixed, and they're much more fluid, they can adapt and change, although of course as we engage with the matrix, we will have to commit, and often a degree in advance. It's just the nature of having to blend with the system we're in. Yes, this can be quite a challenge when making commitments in the matrix. But what I've found, is that even there, if you allow the mind to be open, then if something is truly meant to change, then just holding that knowing (of change) but without flapping and contraction, your building energy can transform the landscape in unexpected ways. Let's face it, we, as evolving people, are MEANT to help change the way things are within the old paradigm - it's in these difficult choices that we do this. There was a lot of intellectual efforting and frustrations created by the perfectionist in me and pulling in entities and nauseating. After a while a surrendering and a realizations that it doesnt really matter what I choose. Seeing that if I keep on waiting for the right choice which is guess is an illusion then I woudnt start at all, I booked the tickets to the nearest city for the available date. Even then there some confusion but this farm owner was available the exact date I was arriving which I thought was a clicking into place. The crucial point you've realised here is, "It doesn't really matter what I choose". Yes, indeed! What matters is what you get from the choice. It is not possible to 'make a mistake' if you're always learning from what happens. This is all about soul infusion - every event and circumstance in your life is inviting that. If there's some tightness or contraction around what happens, then you're revealing ego and shadow side. This can only be a GOOD thing because it shows where inner density constricts the flow of soul. So work into these situations to unleash soul internally through them - confront the distortions of fear, doubt and worry for example. What you then find is that the infusion of soul strengthens, and your creations flow more with the divine creation and get ever more accurate. But there's always flexibility in direction until the step actually lands.